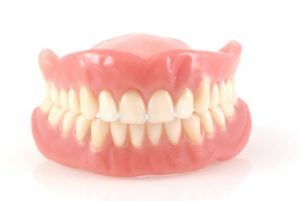 Dentures have been around in one form or another for hundreds of years. Modern versions are light years ahead of those from just a few years ago. They’re made with more flexible materials that adjust to the wearer’s oral profile while offering greater strength and longer life. Today’s dentures look more like natural teeth. They’re designed with lifelike contours and ridges. Many brands allow the patient to choose from a variety of colors to more closely match his or her skin tones. With dentures, you can have your restoration in place and ready for use in only a few weeks. Your dentist will work closely with you to ensure a precise and comfortable fit. Dentures are protected by manufacturer warranties against defects in material and craftsmanship, giving you much needed peace of mind. Traditional dentures aren’t perfect. They take some time to get used to and require liquid adhesives to stay in place. They may also entail some modifications to your diet. But most of these considerations are manageable. All in all, dentures in Medfield are an effective, affordable way to restore missing teeth. Dental implants differ from traditional dentures in the way they’re supported by your body. Instead of adhesives, implants use tiny titanium fixtures embedded in the patient’s jaw just below the gum line, emulating the roots of natural teeth. The dentist attaches the restoration itself to these points, which may consist of a single artificial tooth, a multi-tooth bridge, or a set of implant-supported dentures. Because the treatment is secured by lightweight titanium fixtures, it requires no liquid adhesives and can never accidentally come loose. Implants can last from 20 years to a lifetime with proper care. They will never cause the facial changes sometimes experienced by people who use traditional dentures. Most experts consider dental implants to be the closest thing to fully restored natural teeth currently available. Dental implants are not the best solution for everyone. They require sufficient amounts of healthy underlying bone to support the restoration. The process of receiving implants typically takes several months from the first to the final appointment. Be sure to discuss these facts with your dentist if you’re considering an implant restoration. Both traditional dentures and dental implants are preferable to doing nothing at all about missing teeth. Even a single missing tooth can place unnatural and excessive stress on the patient’s jaw, leading to further tooth loss over time. The gap left from a missing tooth offers a perfect breeding ground for decay-causing bacteria. People with missing teeth face special dietary challenges, may feel awkward in social situations, and, in general, suffer from more health problems than others. Both dentures and dental implants are well worth considering. Talk to your dentist about these and other restoration options during your next appointment. Whichever form of treatment you choose, you’ll look back on the decision with lots of reasons to smile. Dr. David Hirshfield has been practicing dentistry for almost four decades. A graduate of Tufts University’s dental program, he’s a proud member of the American Dental Association and the Massachusetts Dental Society. You can reach his office online or by calling (508) 359-8822.